We will dismiss the CIA denial out of hand: documentation of CIA torture practices and the CIA’s attempts to have DOJ provide legal cover for them now fills many books. However, JSOC involvement in torture is less well-documented despite the fact that JSOC torture played a central, but under-reported, role in David Petraeus’ COIN strategy as implemented in both Iraq and Afghanistan. Petraeus’ primary operative in implementing the torture strategy in both countries was Stanley McChrystal. In 2006, Human Rights Watch released a major report based on dozens of interviews with soldiers who had witnessed the interrogation of prisoners in Iraq. “No Blood, No Foul” revealed that the elite forces conducting the interrogations at Camp Nama and two other locations, known (among other names) as Task Force 121, committed systematic abuse of prisoners at other facilities across Iraq, leading to at least three deaths. Whether or not he was present during the actual abuse — and it seems unlikely that he would need or want to put himself in that exposed position — as commander of JSOC, Stanley McChrystal oversaw them. The only thing Jeff knew about Camp Nama was that he’d be able to wear civilian clothes and interrogate “high value” prisoners. In order to get to the second step, he had to go through hours of psychological tests to ensure his fitness for the job. So, is it just a coincidence that the site at which the Afghans carried out their worst abuses was closed off to the outside world, and especially closed off to the Red Cross, just as JSOC closed off Camp Nama? No, it’s not coincidence at all, because the Afghan military police were trained in detention operations by the same folks in JSOC who operated Camp Nama. Look back at the photo at the top of this post. That’s Robert Harward on the left after having just awarded a spiffy ink-jet-printed certificate to Brig. 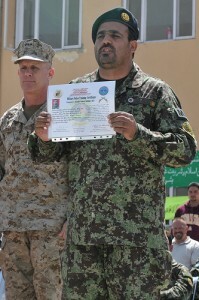 Gen. Saffiullah, Afghan National Army Military Police Brigade commander. This ceremony took place in April, 2010, in preparation for the US handing over responsibility for the shiny new detention center at Parwan that the US built to divert attention from facilities like its own secret facility at Bagram Air Base. From all appearances in the spotty reports available to us, Department 124 for the Afghans would appear to be their equivalent of the secret US site at Bagram. As the NATO commander, the only forces not under McChrystal’s control will be a special US task force that handles detainees, the small number of special operations forces and some support troops from other nations, the official said. The AFP story is not inaccurate, but it is incomplete in its explanation of Gen. McChrystal’s authorities. The story says that “as the NATO commander,” the detainee operations task force is not under his control. While that’s accurate, it does not explain Gen. McChrystal’s dual-hatted role as Commander, ISAF, and Commander of US Forces in Afghanistan (COMUSFOR-A). The latter includes forces serving under the Operation Enduring Freedom mission, which is separate from the NATO/ISAF mission. It appears that Central Command was willing to allow a deceptive portrayal of McChrystal’s role in detention operations to sit without clarification until I pressed them further. This is not surprising, since the Esquire and other reports on McChrystal’s involvement with torture in Iraq were already published and there was a push to put public-relations friendly patina on US efforts in Afghanistan. So it appears that the shell game has progressed to one prison already being handed over to Afghan control. With Saffiullah now in possession of his full color Military Police Training Certificate, he and his brigade are nearly ready to take over control of another prison. Somehow, I doubt that these changes will result in any improvements in the process for Afghan citizens who have been detained to obtain a hearing on whether they were properly arrested. Sadly, my biggest concern at the time was over the possibility that large numbers of innocent civilians would be held in the Afghan-run prisons without a chance for a hearing on whether they were properly detained. Now we know that torture should have been an even bigger concern. Given the documented history of JSOC personnel training Afghan detention personnel and the strong parallels in the worst abuses taking place at JSOC and Afghan facilities, the JSOC denial that they were aware of torture at Department 124 lacks all credibility. Not only would JSOC be aware of these practices, they likely were responsible for putting them in place. If you are out on the road, watch out for this individual. He also drives with his hands over his eyes. Thanks for digging into this, EW. Anyway, what was the name of the secret camp at Guantanamo where 4 prisoners who were murdered were declared “suicides,” their bodies rushed back to their rooms in the main camp where their suicides supposedly took place. My memory remembers something like Camp NAMA. The Wikipedia says that camp was named “Strawberry Fields” because the intent was to keep the prisoners there forever, but that’s not what I thought I remembered. Or am I just losing my mind again? At any rate, I’m wondering if there is a connection between “Strawberry Fields” and Camp NAMA. Maybe at Strawberry Fields they were pushing the envelop on “No Blood, No Foul” only to discover that you can murder people without making them bleed? Of course JSOC is involved in torture, and knew about the torture by Afghan security forces. JSOC involvement in torture at U.S. facilities in Afghanistan was exposed in November 2009 via major investigation pieces at both the NYT and the WashPost. Canadian officials at the time weren’t monitoring detainees after the transfer, which left detainees vulnerable to torture once they were in Afghan hands, said Olexiuk, who met with torture victims during her three years in Afghanistan. She had also written three different human rights reports over three years warning that torture was a common problem in Afghanistan. But Olexiuk said her advice was ignored by Paul Martin’s government. “I don’t think anybody really cared, quite frankly,” she said. And certainly the US media, for the most part, and the morally-dead Congress didn’t care. So this all becomes another Captain Renault moment for us all. Btw, for those wishing to research this issue on their own, they should know that for much of the time in question, Department 124 was earlier known as Department 90, as evidenced by the references to it in the UN report (PDF). I referred to it as the latter in my own article on this, contemporaneous with EW. @Bob Schacht: The secret Gitmo camp was called “Camp No” in Scott Horton’s article about the suicides. @Jeff Kaye: Thanks for filling in more of what was previously known, that’s very helpful. It’s really disgusting how many times torture has been exposed and yet the US moves on as if nobody in the world is aware of it. Since no official action has been taken against the US as a result of the torture, I guess they feel justified in continuing and denying. @Jim White: Ah, yes. That’s what I was thinking of. Thanks. @Jeff Kaye: You are telling us here that? Really, of all people?